Home » Main Course » Veggie Burger Formula ! When you just must have that burger, make a high-protein, vegetarian, burger patty and enjoy it sandwiched in a wholegrain bun! 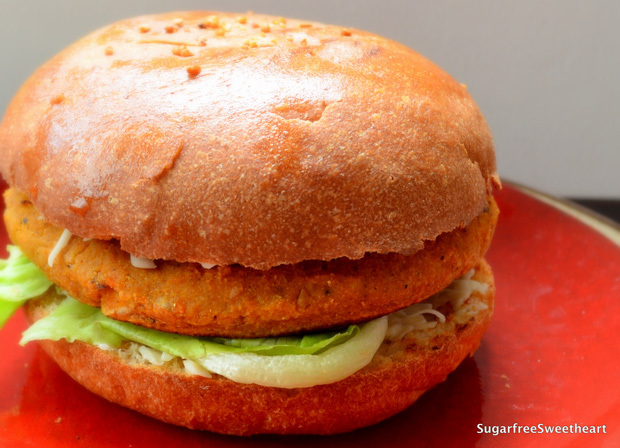 Usually, vegetarian burgers (at least in India) are a diabetic’s nightmare. They tend to be potato based patties served in refined flour buns. Too much simple carbs! So what’s the healthier, tastier alternative? While researching burger patty recipes I came across hordes of amazing recipes using all kinds of different ingredients. Then I found a site that made sense of it all with an easy veggie burger formula that you can use to make up your very own burger patties. And I converted that formula into a simple, illustrated chart! The quantities shown above would make around 8 medium patties or even 16 tiny patties to use in mini burger buns. Choose non-starchy veggies with lower water content (broccoli, cauliflower, carrots, mushrooms, beans, zucchini, etc). Avoid very watery veggies (capsicums, tomatoes, etc). Use chickpea flour or quinoa flour as the binding agent instead of oatmeal flour or other grain based flour for a higher protein, lower carb patty mix. After adding the nuts or herbs, pulse a few times to break down just a little and retain some texture in your patties. Use a few teaspoons of spices. Anything goes — Italian herbs, Mexican seasoning, Indian spices, Cajun, Chinese. Mix and match! Add only a couple of tablespoons of sauce (tomato paste, soya sauce, coconut milk, chilli sauce, Sriracha, Tabasco, lemon juice etc) to the patty just to help bind it. Avoid making it watery. Italian herbs with a pinch of coriander! So there you have it – throw together cooked beans, sautéed crunchy veggies, chickpea flour, spices and sauce to make your very own healthy, tasty burger patties! Yeah! I love the friendly formula diagram. Your version sounds delicious. Simply illustrated. Thank you for commenting and letting me know! I appreciate it! 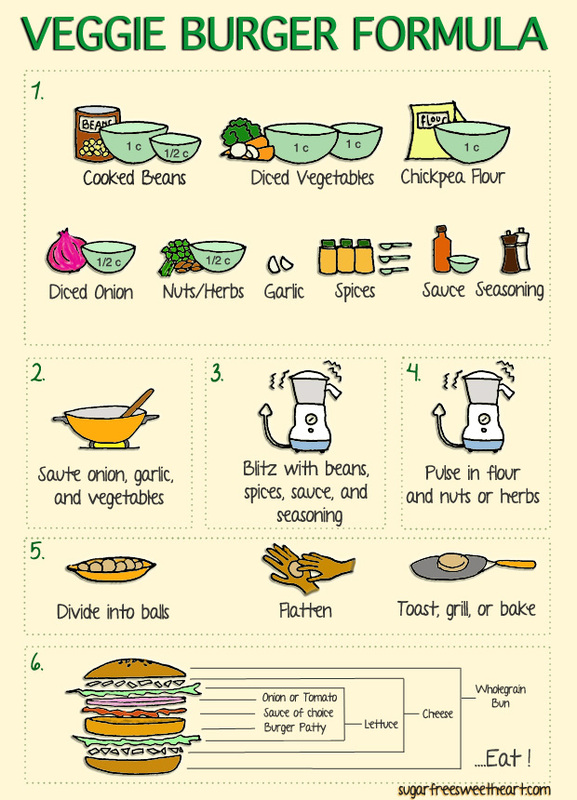 Lovely recipe and lovely illustration! Mmmm look at that yummy burger!!!! I agree Violet! 🙂 She’s the best! I’m so excited to try out these patties. Thanks Sophia! It opens up so many possibilities to create your own, different, patties each time!